A SPLOT on the Web: Imagery – VISA 1110_01. poke her poke her in the stomach! Initial thoughts: banished queen This picture draws the eye to the bottom right off the bat because of the use of vibrant orange in the flames. 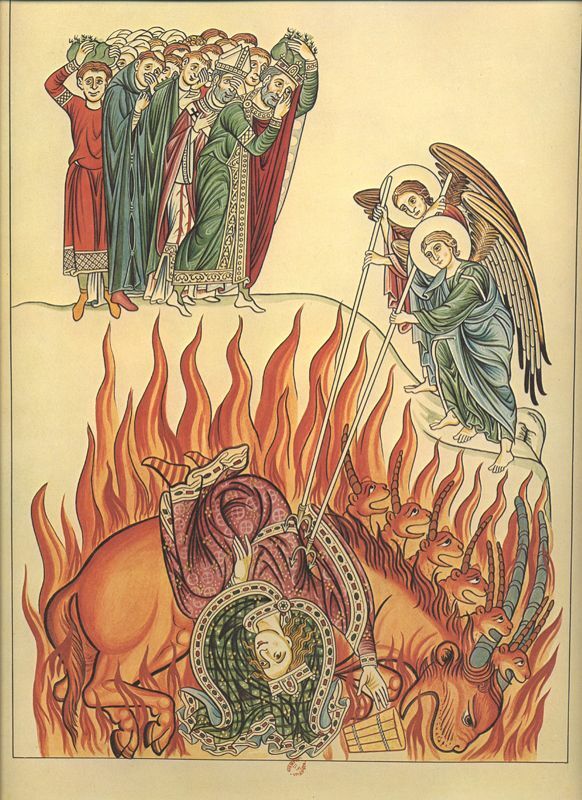 Within those flames there is a queen looking figure that is curled within herself and seems to be being dragged and banished to hell. This theory is furthered by the angels in the top right corner who seem to be poking her with mini tridents and the group of onlookers in the right that include a bishop who looks concerned and a king who looks distraught. We also noticed what looks like an empty bucket burning beside the queen and scratch looking marks on her hands. We believed that these were signs of someone or something trying to have saved her but failing. This picture does stay in a very clear defined picture plain and also looks like it comes from a medieval manuscript. We also believed that this may have been relatively small and in a corner because it lacks the large amount of detail that most big manuscript pieces seem to have.